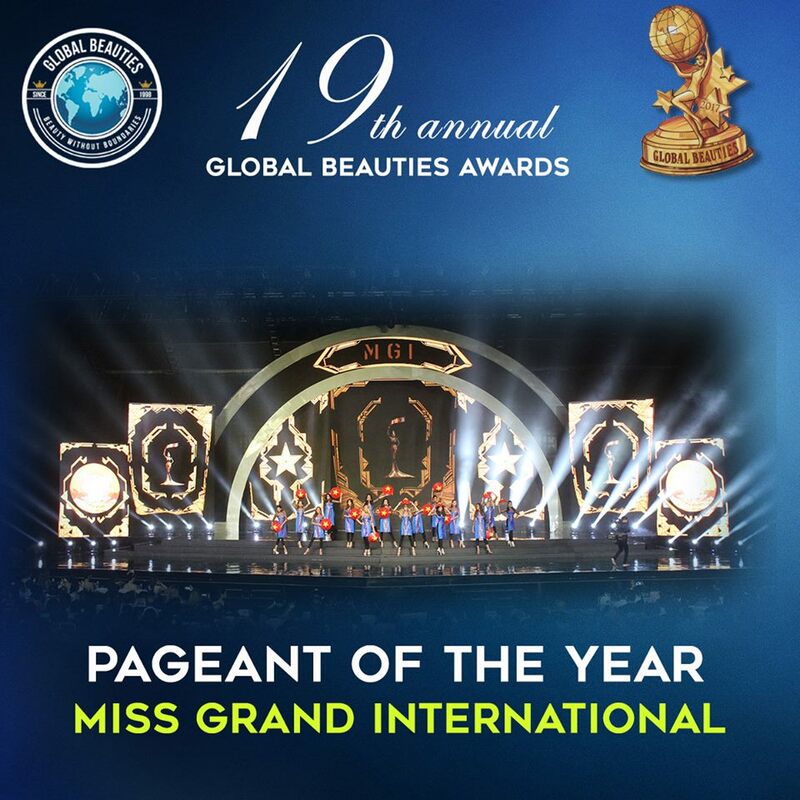 19th Global Beauties Awards: Pageant of the Year 2017 is Miss Grand International! In its 5 years of existence, the Miss Grand International Pageant has gone from strength to strength and the 2017 edition of the pageant in Vietnam was a spectacular event. Glamorous final and preliminary shows, lots of activities and the best treatment possible for the young women competing in the pageant, a free and fair selection process, massive social media all helped Miss Grand International to secure Global Beauties' top honour for the 2017 season. Though there is still room for improvement like technical aspects of the final broadcast, the consensus was that Miss Grand International should be honoured for how far they have come in a short amount of time. It may not have the media reach of Miss Universe and Miss World, and organizers make it very clear that television is not their primary goal, instead, the pageant bets the internet is not only the future, but rather the PRESENT, and really involves the fans with hundreds of live webcasts, but Miss Grand International delivers the entertainment value that pageant fans treasure. It was consistent from day 1 to the final show and deserves the golden Yulia for "Pageant of the Year"! We must say that 2016 in Las Vegas might have been risky and put its credibility in jeopardy (although it was a bold move! ), but in 2017 it went back to what it was in 2013, 2014 and 2015, and even better! How far can Miss Grand International go in the future? With the passion we see organizers putting in it, the sky is the limit! Miss Universe delievered an excellent final show, the best among the 5 Grand Slam contests, after quite a long time. However, preliminary events were extremely disappointing not only for the fans, but also for the delegates and national directors we spoke to. In 2016, in the Philippines, it was the other way around. sensational preliminary events and a lousy final show. Let´s hope for a combination of both in 2018! Miss World improved so much its television show in 2016, that GB awarded it as The Pageant of the Year 2016. It became more upbeat, quarter-finalists and semi-finalists got to walk the runway, be interviewed, they got to ACTUALLY COMPETE ON STAGE. It looked like the beginning of a new era. However, although in 2017 Miss World candidates had on going exciting preliminary events (first time in years), the all new and super bright Head to Head Challenge (best innovation of the year in the pageant business! ), coversely, its final show was clearly a step back from 2016. After a good opening number, stage competitions were gone, there were too many "tops", and no time to appreciate or somehow judge the candidates. The production from 2016, with the stage and lights of 2017, would be a perfect combination. Fingers crossed for a magic 2018! Miss Supranational has the most extraordinary stage in the industry, great music, fun dancing and stage numbers. It needs to improve its opening number, script and pre-pageant activities. The level of candidates, which had always been great since 2009, clearly went down in 2017. We hope to see it back to where it belongs in 2018! Miss International is traditional and old fashioned. Pre-pageant activities are amazing and that should be kept. But it needs to revamp the final show. What is the use of electing a Miss Philippines (2016) and a Miss Indonesia (2017) who were not favorites in order to get more followers, and not making the show better? Organizers should think about it. It has a strong brand, tradition, potential. But it needs to wake up and realized that we are almost in 2020, rather than in 1965, where the current production belongs! Congratulations to Miss Grand International, the 2017 Pageant of the Year Yulia winner! !